Charles Leclerc underlined Ferrari's impressive start to 2019 as Pierre Gasly crashed his Red Bull on the penultimate day of testing. 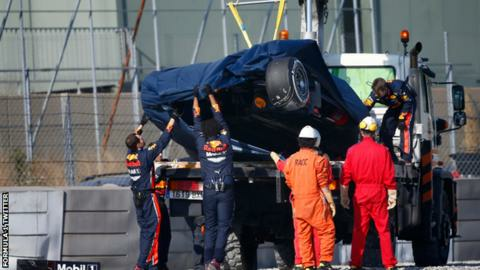 Leclerc set the fastest time of the winter by more than half a second before Gasly damaged the Red Bull at the high-speed Turn Nine, his second crash this winter. Mercedes driver Valtteri Bottas said he felt Ferrari were ahead of the field. "They are looking very strong," the Finn said. "We need to unlock more from the new package to be able to compete with them," the Finn said. Mercedes have been struggling to get their car to behave consistently so far in pre-season testing, but Bottas said they had made progress with the major aerodynamic upgrade that was introduced for this week's second and final test. "From last week to this week, definitely we have been able to improve the overall balance of the car through the speed range, overall grip, downforce and stability," Bottas said. "But in all those areas we can still do better. It is not a perfect car yet." Leclerc, who joins Ferrari in only his second season in Formula 1 after a stellar debut for the affiliated Sauber team in 2018, said he was happy with his team's progress after recording a time of one minute 16.231 seconds. "The car feels comfortable from day one," he said. "The balance is pretty nice and it hasn't changed today. So it's a positive day. "The car is solid. I feel pretty comfortable in it. There's still a lot to learn but it's a good start. It's good to be on top [of the times] but it doesn't mean anything." Ferrari had endured a difficult time over the previous two days. Leclerc did much of his running on Tuesday with a problem with the cooling system, and the Monegasque was hit again on Wednesday when he lost all his time in the car after Sebastian Vettel crashed because of what Ferrari said was a wheel failure. Leclerc ended his day by stopping on track because of an exhaust problem. Pre-season testing times are notoriously unreliable indicators of form because it is impossible to know the specification in which teams are running their cars, while fuel loads, engine modes and other aspects can make a significant difference to performance. Alexander Albon, the Britain-born Thai driver, was second fastest in his Toro Rosso, ahead of McLaren's British rookie Lando Norris and Gasly. It was the Frenchman's second significant crash of pre-season, after a previous incident last week in which he lost control at Turn 12. This time, he brought his pre-season to a close when he lost control at the demanding uphill Turn Nine, the fastest corner on the track. Gasly spun and smashed into the barriers, badly damaging the car. World champion Lewis Hamilton set the 10th fastest time - an impressive 1:18.097 on the second hardest tyre, while nearly everyone else set their best laps on the softest rubber. There is one remaining day of testing this week, before the season-opening Australian Grand Prix in Melbourne on 14-16 March.